We had a chance to speak during the winter edition of Baltic Games 2014 with a pro BMX rider. Marcin Oskiera shared his feelings about being a pro rider and about his plans for 2014. You have also a chance to read about his opinion about the sport progress in Poland. Marcin, please say a few words about why you have chosen to pursue BMX, as opposed to other sports? The beginning of my adventure with BMX is not an extraordinary story. You know, two of my friends got BMX bikes and as a child I loved riding a bike. I realised that I rode on the rear wheel of my bike very often. I decided that I would love to be a happy owner of BMX and it would give me a chance to ride with them, because as you know BMX gives you an opportunity to do tricks. After three months my father bought my first BMX bike. As you see, everything worked! After so many years, I enjoy this sport till now. Honestly? It’s hard to say. I have always been fascinated by sports, starting from football, skateboard temporarily, but BMX has always attracted me. I know one thing, If I never got into BMX I would do something similar to what I’m doing at the moment. Something that would give me the opportunity to pursue the sport. I do not have my favorite place to ride. I have some places I like, for example in Białystok, Bydgoszcz and my local place in Milanówek – the stadium MILAN. What is it like to be a professional rider? Just like everyone else I have my responsibilities and plans that I realize every day. I have a little more free time so I am able to ride a bike, at least several times a week. By the way, I would like to invite interested people to visit my site on fb www.facebook.com / instagram @oskierbmx. You are sponsored by Lando, AllDay, Bmxforever, Primobmx, Kinkbmx, what could you say about the cooperation? 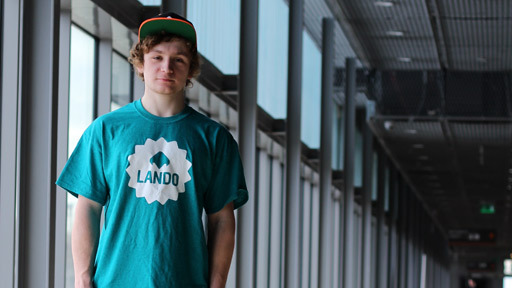 I am pleased with the cooperation with the shop allday.pl, bmxforever.pl and Lando company. Cooperation is very good. I hope that everything will develop in the right direction. I am an optimistic person and I’m open to joint projects! Currently I arrange matters related with my graduation and receiving a diploma. Beyond riding I like watching movies, playing on the computer and hanging out with my close friends. As someone who has been a rider for a long period of time, when you look in the future, do you still see yourself as a part of the BMX scene? Definitely yes! I met a lot of fantastic people from different parts of the country and the world. I visited many interesting places. I hope that in the future I will stay involved with BMX and for example I will organize events. I think the BMX scene is developing incredibly fast. I hope that in our country they will build many new skateparks including indoor parks. I’m surprised how easily young riders learn. I think they have a better conditions to start riding. I think it has also a big influence on their skills, they can develop much faster. The year 2013 has finished, do you have some goals to attain this year? Of course! I have already some specific plans for this year. I want to take a part in competition beyond the borders of our country, but it does not mean I will not take a part in larger events organized here in Poland. What is your favorite/best trick? Is there any trick you have always wanted to do but you can not? My favorite tricks: Ice Pick and 360 Table. My best performance is 36 Triple Barspin and Decade/Truck to Fj Whip. I wish I could do Flair, but somehow I don’t pay enough attention. Probably this is the main reason why I can not do it! My parents would have to be my number one influence in my life! Beyond my parents, of course my close BMX friends with whom I keep in touch. I would like to greet my parents, sister, close friends who support me and help and of course I would like to thank my sponsors! If not for their help, it would be difficult to achieve my successes so far. I am very grateful! Thank you very much for the interview and I hope all your dreams will come true.